It’s no secret that the best way to prepare for an interview is to practice answering questions aloud. Problem is, aside from a handful of illegal interview questions, the hiring manager can pretty much ask you anything under the sun. I’ve heard of interview questions ranging from “How many golf balls would fit in a school bus?” to “Tell me a joke.” So, where do you even begin preparing and practicing? Wouldn’t it be a lot easier if you just knew what your interviewer was going to ask? Well, while I can’t give you a concrete list, there are a few sneaky ways to get a pretty good idea—so you can focus your interview-prep energy and go in as prepared as possible. Obviously, the best case scenario would be having someone who went through the same interview experience give you a play by play. That’s probably not going to happen, but the next best thing is checking for interview questions on Glassdoor. Select “Interviews” in the dropdown menu next to the search bar, and then type in the company you’re interviewing with. You should get interview questions for a variety of positions at the company. While you can further narrow down your results to your exact position (if you’re lucky), I’ve found that getting a sense of what types of questions the company favors in general to be helpful. Definitely look closely at the questions for your specific position or similar positions, but also pay attention to whether the experience leans toward behavioral questions, technical questions, brainteasers, cases, or a mix. This will start to point you in the right direction. Or, if you’re applying for positions with strict technical requirements, consider how the company will evaluate your expertise. If you’re applying to a programming position that requires in-depth knowledge of computer science, you might get a more definition-based question like, “What is recursion?” or a more in-depth application question like, “Write a function that sorts this list using a recursive algorithm.” Add these questions to the list you’ve culled from Glassdoor. It would probably be a better evaluative tool if interviewers asked everyone the same questions, but that’s not always the case. In reality, hiring managers will often have questions that relate specifically to your background, especially if there’s anything on your resume that’s particularly different (a career change, a long gap) or interesting (time spent abroad). So, consider this: If you were the interviewer, what would stand out or pique your interest? What would you ask yourself? Add the standard “Tell me about yourself” and “Walk me through your resume” to your list, as well as anything else that might stand out about your previous experience. Of course, at some point, there is only so much you can do on your own. So turn to your network: If you know anyone or have ever conducted an informational interview with someone who has worked for the company you’re interviewing with, this is the time to call them up. Explain that you’ve been invited to interview and are exceptionally excited. In fact, you’ve been working hard to prepare—and any additional advice this person could share would be greatly appreciated. You might not get exact questions this way, but sometimes you’ll learn a thing or two about the people you’re interviewing with. Maybe your hiring manager happens to really prefer written thank you notes, or is obsessed with punctuality. This is very good to know. Lastly, remember that if you’re being invited to interview, the hiring manager wants it to work out. The company needs to fill this position—and the sooner, the better. No one’s out to get you. In fact, the hiring manager is rooting for you. So, don’t underestimate what you can learn from just asking how to best prepare for the interview. You’re probably not going to get a list of exact questions, but you may get a sense of general topics that might be covered, who you’ll be meeting with, and what to expect on interview day. Similar to what you did with the job description, create questions based on what you learn, and add them to the list. Now that you have some direction and a short list of likely interview questions, practice! Don’t get stuck mulling answers over in your head or typing up long elaborate answers to your questions. Practice answering these questions out loud a few times, and you’ll be just fine. Top international business schools and universities meet prospective English-speaking applicants in uniquely personalised educational One-to-One event and Open Fair in Lagos on 4thSeptember 2018 and 5thSeptember 2018. With its balanced blend of theory, practice, and networking, the Master’s degree has become a valuable asset to have under your belt. Whether prospective students are headed to a Master of Business Administration (MBA) degree or Masters in Management, Finance, or Accounting, the future is looking bright for graduates across business-related disciplines. What is more, the prestigious qualifications are increasingly well regarded in a wide range of non-business fields all over the world. Recent Masters and MBA graduates from top international schools continue to be the disruptive and innovative force across any industry, continent, or professional field. Determined graduate school applicants should take the opportunity to talk with university representatives one-on-one in order to find out if the Masters or MBA programme will help them reach their personal and professional goals. In addition, the meetings can portray the personality and approach of a school and show if they are compatible with the applicants’ expectations. University representatives also provide feedback on how competitive it is to get admitted. The MBA and Masters degrees differ in terms of admission requirements, budget, career prospects, and student profiles. For those who are yet to decide, what could be better than meeting MBA and Masters programme representatives at the same time, in the same place? 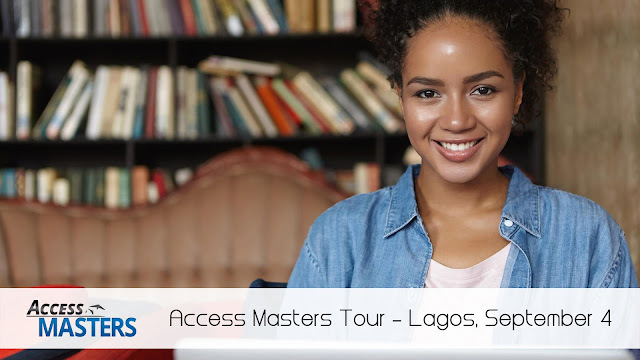 The Access MBA and Access Masters events, taking place in Lagos on September 4th and September 5th provide the unique opportunity for potential applicants to talk in-person to international business school representatives from INSEAD, IE Business School, EDHEC Business School, Western University – Ivey Business School, Hult International Business School. The MBA and Masters One-to-One events enable prospective students to meet the representatives of business schools and universities that correspond to their professional background and expectations. The schools and the candidates are already familiar with one another and each 20-minute meeting is spent discussing the topics that matter the most. In addition, during the Open Fair prospective Masters applicants can meet all participating universities and get details about the full scope of their graduate programmes in diverse fields such as STEM, Social Sciences, Humanities, Business, Management, Finance, Accounting and many more. · Studying for an MBA or a Business Masters can help you not only acquire valuable knowledge and skills, but also network with successful professionals in the industry.